Published in the Dover Express, 18 April, 1980. 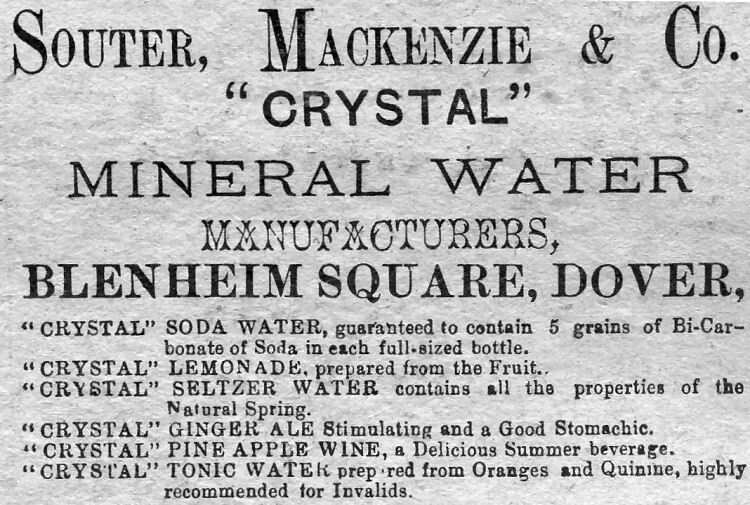 Another institution of note in Blenheim Square was Messrs Souter Mackenzie's "Crystal“ mineral water works, run by Mr P. W. J. Mackenzie, JP. Earlier these buildings were used by Mr Stanton, a sailmaker. St John’s Mariners’ Church was also in Blenheim Square, standing at the south-east corner facing Middle Row, a lane which led to Seven Star Street. This church passed through many vicissitudes. It was built by Mr Iggulden, for a congregation of Wesleyan dissenters in 1822. It afterwards passed into the hands of the Independents; and, on their vacating it, the incumbent of Trinity Church took it for an evening service, until his own church was fitted for that purpose. Subsequently, it was taken by Miss Marryatt, sister of Captain Marryatt, author of a classic book on life at sea, "Midshipman Easy.“ Mr Richardson, of the Countess of Huntingdon's Connexion, was appointed to conduct services especially for mariners. For want of success, Miss Marryatt abandoned her effort; and then General Cosmo Gordon and Admiral Sir W. G. Parry, being anxious that services for sailors should be continued, introduced the Rev William Yate, who commenced his ministry there in March 1846. The church had not been in use for a number of years prior to its demolition in connection with the Pier Improvement Scheme. Seven Star Street was a narrow thoroughfare at the rear of Beach Street. It started from Clarence Place, beside the King’s Head Hotel and continued up to the boundary of the Dover to Folkestone railway line. It is said to have derived its name from a public house which existed there. Seven Star Street, during its three hundred years existence was always a mariners’ quarter. The road to the Admiralty Pier to which one descended on crossing the railway via the old concrete bridge at the Crosswall is called Clarence Place. Before the Viaduct provided an alternative road, Clarence Place was the only way that was known to those unfamiliar with the tortuous route via Limekiln Street. It was connected with Strond Street by a railway level crossing, with gates at the Crosswall. Vehicular traffic was much troubled by the lengthy periods during which these gates were closed, and there was frequent contention with the London, Chatham and Dover Railway Company. The Dover Tramways system, when it started in 1897, was continued over the level crossing and along Clarence Place to the front of the old town station of. the South-Eastern Railway, but after a few years the delays caused that section to be abandoned. 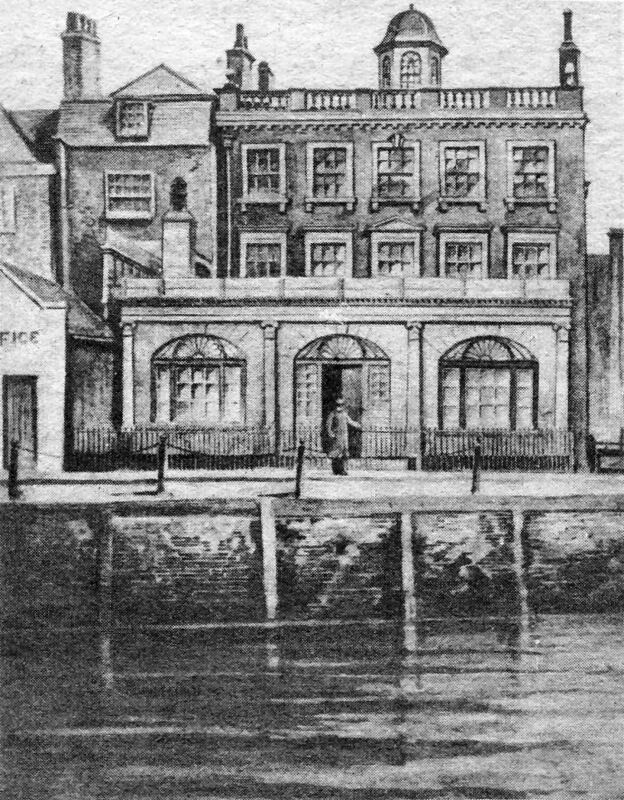 In Clarence Place were many well known hotels, including the "King’s Head,“ "Dover Castle,“ and the "Royal," as well as the "Cinque Ports Arms“ and the "Rose and Crown" public houses. The “Dover Castle" Hotel, in earlier days, stood on the other side of the harbour; but the “King's Head“ stood in the same position from the time of James I. Before alteration in the early part of the 19th century there were, in the upper rooms, carved panels dating from 1624, one of which contained an escutcheon with the letters "W.A. and B.“, being the initials of the original landlord and his wife—William and Ann Bradshaw. The carving was removed and placed in the museum. Elizabeth Street, Strond Street, Custom House Quay and the Crosswall, belonging to the older part of the Pier, were originally formed on reclaimed land between the great pent (now called the Wellington Dock) and the old Paradise pent. The upper part of Elizabeth Street was an offshoot from Limekiln Street, and terminated at the north-west corner of Paradise pent, where Mr Diggs, about the year 1590, built a sluice and a store house, with Queen Elizabeth’s effigy upon it. The space between Elizabeth Street and the sea was, at that time, a tidal area, which, at low water, presented an unsightly waste of beach and mud. 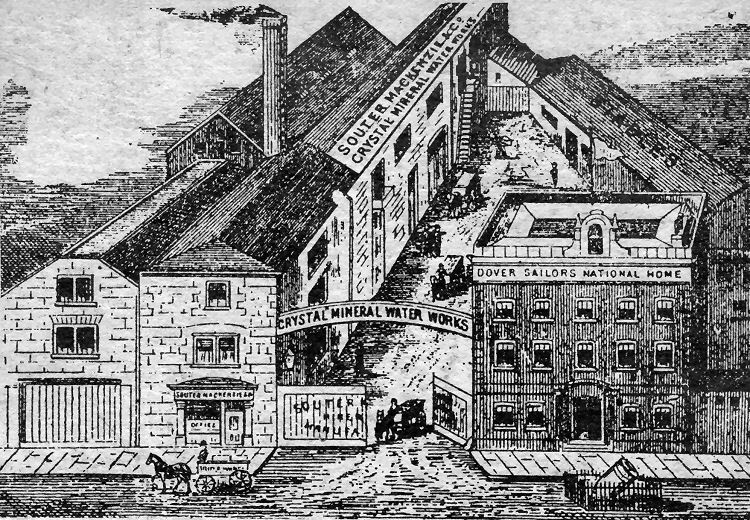 The Souter, Mackenzie & Company “Crystal" mineral water works at Blenheim Square, complete with stables at the rear, in the old Pier District. Adjoining are the premises of the old Dover Sailors’ National Home in front of which is the Russian mortar which gave the square Its name. Above is one of their advertisements of the late 1880s. Above is the impressive Strond Street mansion of the Minet family who founded a shipping business in Dover in the time of William III. At this house in 1814 Louis XVIII spent the night on his way back to France after 22 years of exile and had breakfast with the Prince Regent. The same year the Emperor of Russia was a guest. The house was demolished in 1871.